This weekend was our first annual American Heritage Girls Camping weekend. The girls were really, really, really, looking forward to this weekend. 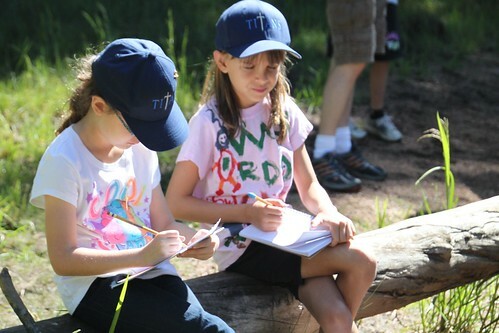 Both because there would be camping, which they love, but also because the girls from our troop would be there too. I think there ended up being about 10 families there all together. We reserved camp sites all together so that the girls could take over the whole area and just be crazy. 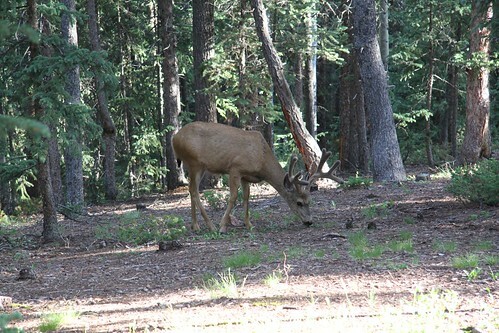 For this years event we decided on staying in Mueller State Park down in the Colorado Springs area. We hadn’t been there before so it was fun to go somewhere new. The sites were heavily wooded and these could be seen everywhere and often. They had no fear of the humans and could often be seen just chilling outside your tent. On our first night we had a family get together and shared some strawberry shortcake. We were hoping for some smores but there was a fire ban in effect. After dessert, we went to a ranger led talk on coyotes. To which one of our girls raised her hand and asked the ranger how coyotes mate. Lots of giggles on that one. The next morning we headed out early to our event for the day. 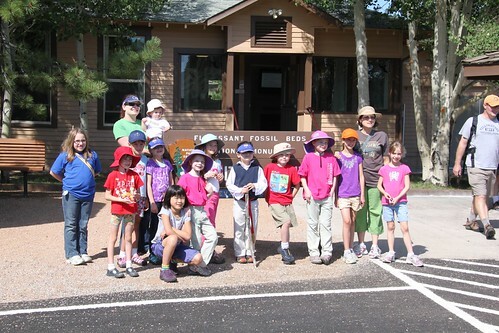 We were headed to the Florrissant Fossil Bed National Monument. 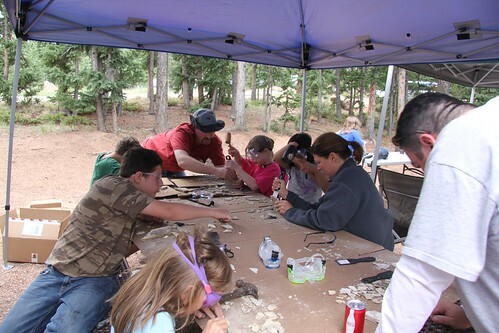 This park is well know for being the biggest dig spot for fossils in the US. Long, long ago this plain was a huge lake towered by a volcano. And, you guessed it, the volcano erupted. Causing flows of mud and lava down over the lake. All the creatures and plant life were encapsulated by the mud flow and fossilized. Back in the 1800’s this was considered a tourist attraction so 1000’s of the fossils were taken by local families. Today the park is protected and it is a federal crime to be caught digging on the property. During the eruption hundreds of huge redwoods were also hit by the mudslides. Causing the tree base to become petrified. Here is an example of one. 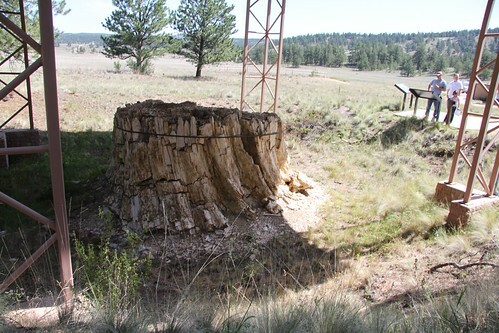 Again, in the 1800’s the locals tried to unearth the trees using dynamite?? So most are either completely destroyed or falling apart. The park has enclosed them in steel straps to try and hold them together. 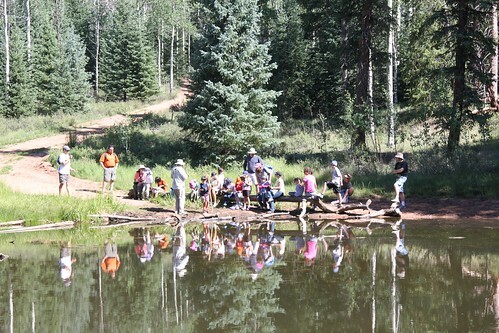 Our troop was lucky enough to get our own private ranger talk and led walk. Here the kids are demonstrating how the redwoods became petrified by the mud flows. 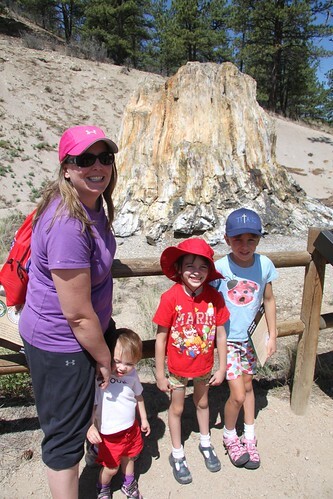 Here we are in front of the best kept petrified tree stump. By the time the settlers found this one they had learned their lesson to not use dynamite. Although, they did try to dig it up to take to the worlds fair. After realizing the stump was too big they decided to just cut out a small square instead. You can see the square on the top left portion of the tree. 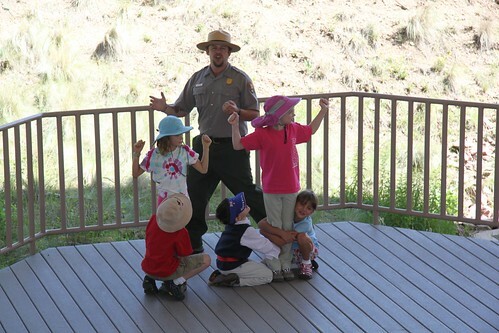 One cool kiddo feature to the US Parks these days is the Junior Ranger Program. The kids receive booklets of things to do and find in the park. After completing so many activities they are officially sworn in as a Junior Park Ranger. They even receive their own Park Ranger Badge or Patch. Most of our girls decided to go for this honor. 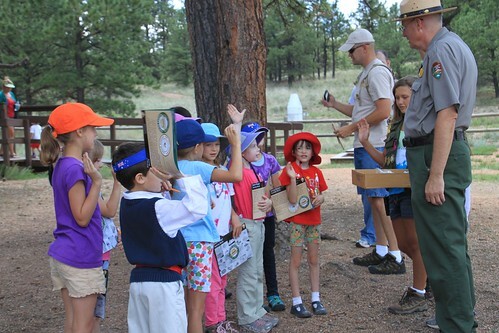 Here they are getting sworn in by our great Park Ranger. 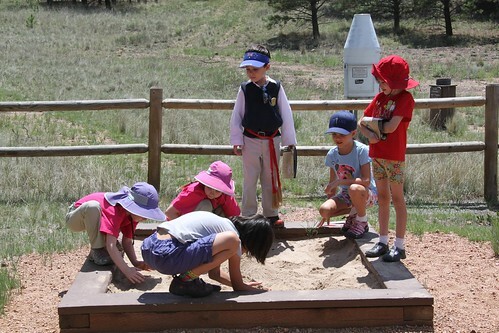 Last but not least, the park had its own fossil dig area. The kids took turns digging for fossils. But, I think there was more talking then actually digging. After enjoying a picnic lunch at the park we headed back to our camp sites. The unit leaders set up some tents and had various activities for the kids to enjoy. One of the Dads was able to purchase buckets of shale at a nearby stand. 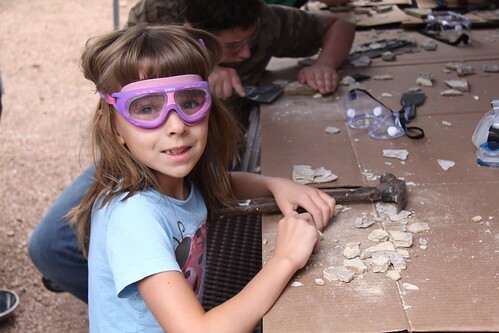 With goggles, razor blades, and mallets in hand the kids were able to carefully peel away layers of the shale and find their very own fossils. 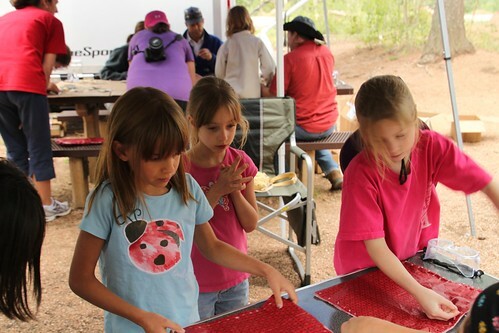 It was such a great experiment for the kids to see how fossils are actually found. And to our surprise it was actually fairly easy to find your own fossils. Most of our girls found several small insects hidden in the shale. Very cool activity! Another Mom brought materials for the girls to sew their own camping sit-upons. 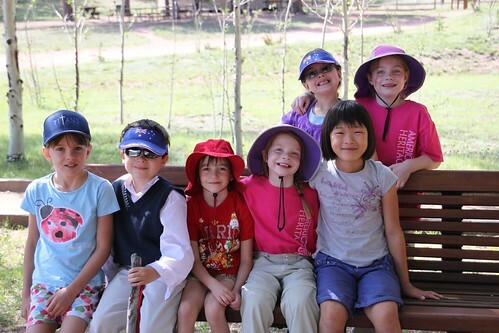 Mr Kingswood, a Dad, is an avid birder and volunteered to help the girls earn their birding badge over the summer. 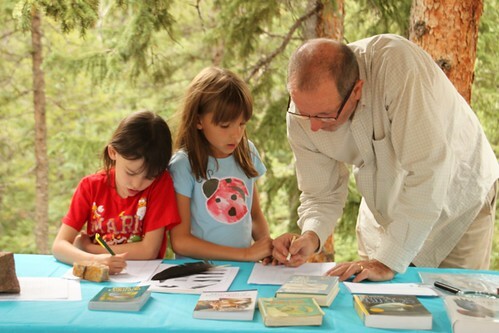 He donated birding books, bird diagrams, and bird informational packets to all girls interested. To which we were very grateful. Here, he set up a station for one of the birding requirements. The girls were to look at a bird feather under a microscope and draw the various parts of a feather. Soon after this is started to rain a bit so we moved to our tent for some rest. Later in the evening we gathered together for a potluck dinner with hot roasted hot dogs. The next morning was Sunday and we had to pack up and be out of our site by noon. First we took a short birding walk led by our birding dad (another badge requirement). At the bottom of the walk there was a small pond. Mr Kingswood led the girls in a small devotional service. Sydney was prepared with a small notebook to take any necessary notes. She was so enjoying just being outside with all her friends. Happy to say our first AHG Campout was a huge success. The girls all had a great time getting to know each other even better with no school or rules tampering their spirits. It was great to meet the families and just spend some quality time with our friends. Can’t wait until next summer! After leaving the campground we were starving and ready for some hot food. 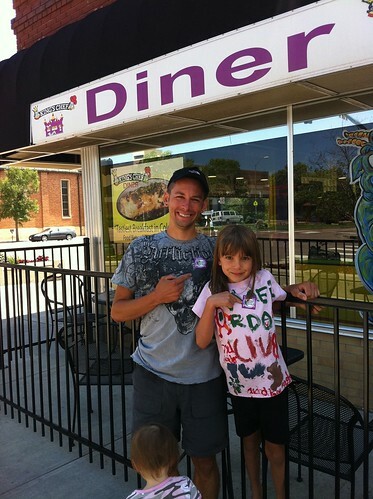 Dad, knowing only a few restaurants in Colorado Springs, took us to one local favorite. King Chef boasts a clean plate sticker if you eat all your food. And they really mean ALL your food. Even a piece of lettuce which fell off your burger counts. It was a little dive on a back corner of downtown. I was a little nervous. But, the food was great! Sydney took the clean plate challenge to an extreme. Dad offered to help her eat her food but she would have none of that. I definitely need to figure out how to transfer this to home. Here are the two happy clean plate winners and their stickers.